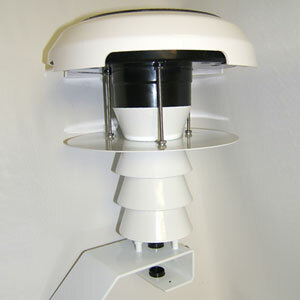 The 380-283 Fan Aspirated Solar Radiation Shield includes a solar powered fan mounted on top of the shield. The shield is designed with a highly reflective white surface to reflect the sun's direct radiation. 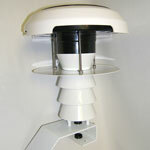 The 380-283 Fan Aspirated Solar Radiation Shield includes a solar powered fan mounted on top of the shield. The shield is designed with a highly reflective white surface to reflect the sun's direct radiation. It is constructed of powder coated aluminum and consists of a flat deflection plate, three wedge-shaped plates, and a mounting arm. The wedge-shaped plates provide maximum airflow around the probe while at the same time minimizing direct exposure of the probe tip to sunlight. The use of multiple plates with openings in the top of each promotes a rising flow of air through the shield. The shield provides protection from scattered as well as direct radiation.